For the first 12 hours on June 29 (midnight to noon), approximately 8,475 barrels of oil were collected and approximately 4,130 barrels of oil and 28.7 million cubic feet of natural gas were flared. As the well continues to descend there will likely be an increased focus on determining exactly where the two wells lie, one to another. 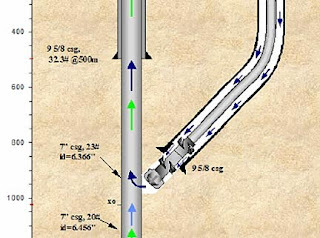 This requires a process that pulls the drill string each time, and so progress is likely to be slow as the RW reaches the level at which the entry into the original well will be first tried. Kent Wells has described the process. But he does not describe how the wells will be connected. And I will make a little more detailed description of a possible way of doing this, that John Wright has used before, at the end of the post. 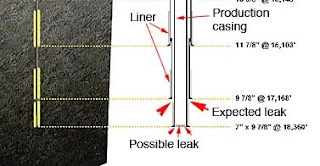 Note that Kent Wells points out that the ranging runs do not start until the final set of well casing has been set. (And this was completed on June 19th). 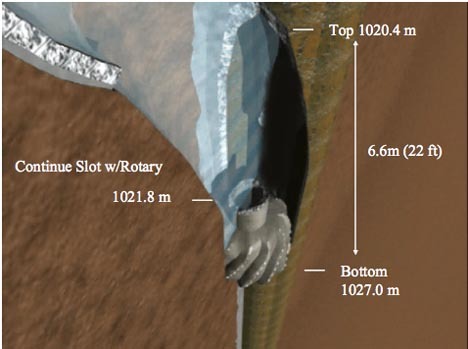 Once the casing has been set, the procedure calls to drill 275 ft of MD (measured depth), and then pull the drill. 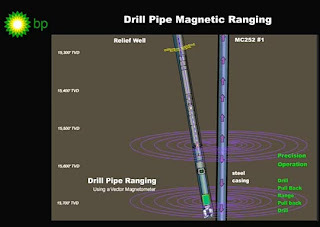 The instrument package is then run into the hole with a Vector Magnetometer, which is mounted on a wire to carry it in and out (known as a wireline). The process of drill and test, using the Magnetometer, continued until the steel casing in the original hole had been detected. 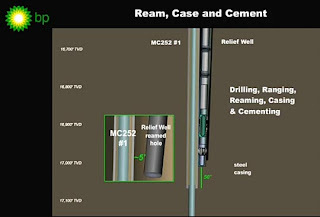 Once the initial well has been found the procedure changes. 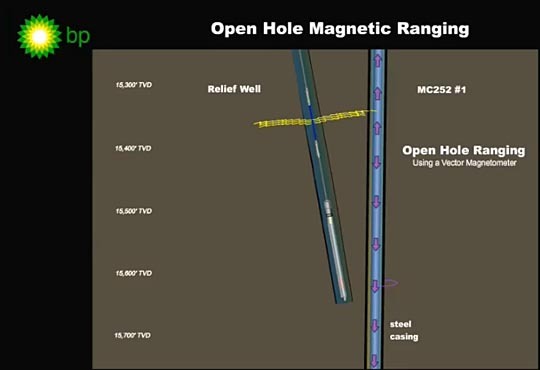 Now after the well has drilled down an additional interval (a distance decided by those monitoring progress) instead of pulling the string all the way out and running the wireline in open hole to find the casing, the bit is only retracted to the cased section, and the magnetometer package is wirelined down inside the drill string. 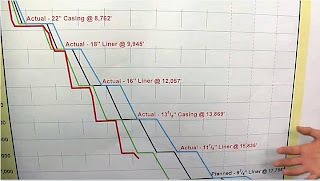 At present they have made two ranging runs, and have found the initial casing, so that then know that they were 55 ft from it, and they have 16 degrees to turn the well through yet to get it parallel to the original. They have decided that this “additional interval” will be 125 ft, and then they will make another ranging run. But the process is now changed so that in the new run this will be where the instrument is run inside the DP (drill pipe) instead of pulling it to the surface. After making a measurement it is pulled back out on the wireline. 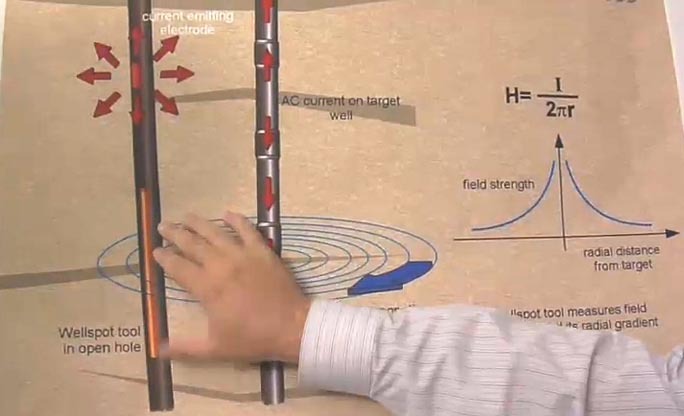 And then the drill can advance the hole a little, it then is backed off the bottom, and the magnetometer again is lowered and locates the original casing, this is plotted and the process repeated. Only the wireline was pulled to remove the magnetometer from the well during drilling (to allow mud to the bit to cool it and remove drill cuttings). 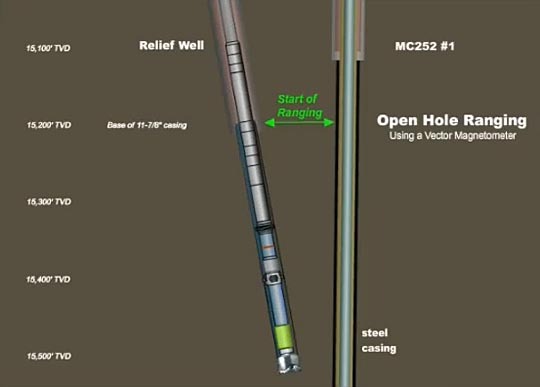 Once the RW passes the original well it will be turned to drill parallel with it and drill down its own 10 1/8th inch hole until it reaches a point just above where the 9 7/8th inch casing liner ended at the bottom of the original hole. With the new well 50 ft above this point, and 5 ft from it, the relief well will be reamed at the bottom using a 12 ¼” reaming bit to widen the well at the bottom. A 9 7/8” steel liner will then be run into the hole and cemented into place in the relief well, running back up to the 11 7/8” casing that was set at the beginning of the process. 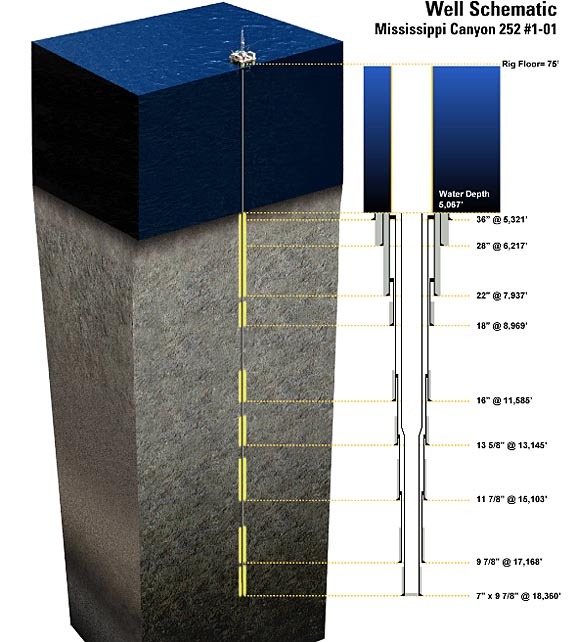 The relief well will then end 50 ft above the bottom of the 9 7/8” liner length in the original well and 5 ft from it. (Remember that there are questions as to whether the oil is flowing up around the outside of the steel tube inside this one, or up the middle of it). 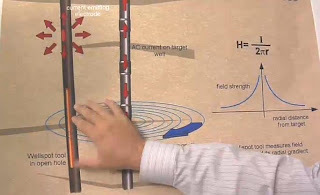 Now what is interesting, and missing from the presentation, is how the connection between the two wells is made. There is also a little discrepancy over where the hole will be reamed and the 9 7/8” casing will be run to. In the animation it is shown as 17,050 ft (above) and in the visit to the rig, at 17,758 ft. (I think, based on looking at the log that that number should be 17,158 ft, for the top of the 7” x 9 7/8” casing, which is the problem length. 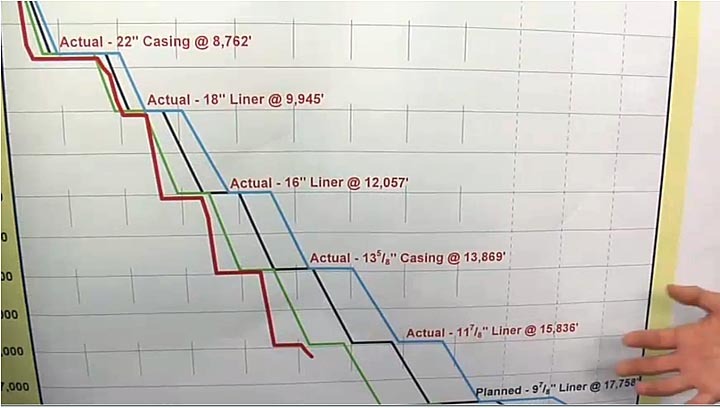 So the BP discussion ends with the RW 50 ft above, and 5 ft over from where the problem might be located (at the bottom of the lined well length) where the oil and gas may be seeping up the outside of the production casing and entering the well. 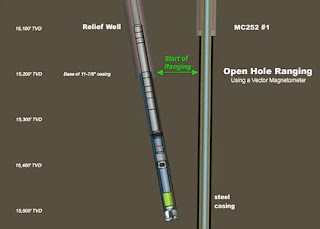 Let’s remember what the well liner and casing look like, down at the bottom of the hole. 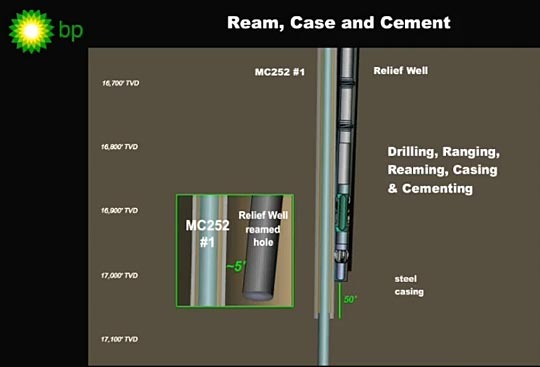 a) try and drill down into the leaking zone below the last liner section, intersecting this to use the channels created to carry the mud from the RW into the original well. b) Mill over to the liner segment of the well and through it into the annulus between the production casing and the liner, and try bottom kill from there. c) Drill further down and over to mill through and access the production casing, and inject the mud into this to kill the well. And the illustration of the milling bit (which can make the cut in only a few seconds). Incidentally the company is now part of Boots and Coots.